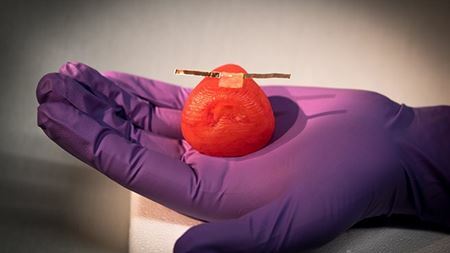 Researchers have 3D printed life-like artificial organs that mimic the exact anatomical structure, mechanical properties, and look and feel of real organs. With 3D printing, researchers have created a metamaterial from cubic building blocks that rotates about its axis in response to compression forces. Researchers have developed a bacteria-containing, hydrogel-based ink for producing objects with various different properties by 3D printing. By studying an unprecedented range of disordered solids, scientists have defined a parameter called 'softness’ that can predict the location of defects. Scientists have developed a technique for combining carbon nanotubes with ceramics and polymers to form novel composite materials. New research reveals that when spraying metal coatings, melting hinders rather than helps. Using 3D printers, engineers have turned formerly theoretical structures known as schwarzites into strong, light materials with repeating patterns. Graphene’s unique properties makes it a potential candidate for transparent, stretchable electronics in displays, wearable health monitors, or soft robots. Why don’t tree frogs slip off wet leaves? The answer lies in their sticky toe pads, which are made up of a mixture of hard and soft materials.